Freshman class is the second largest in the history of the university. COLUMBIA, Mo. – On the first day of classes, the University of Missouri welcomed the most diverse student body in its history. With 34,111 students enrolled, diversity in the student body increased 3.4 percent compared to this time last year. 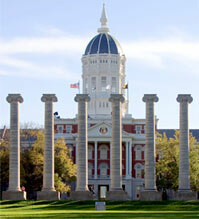 In spite of declining high school graduates, Mizzou’s freshman class of 6,227 is the second largest in MU’s history, second only to last year’s class of 6,560. International and out-of-state students increased as well. The number of international students enrolled this year is currently 2,109 compared to 2,041 last year, a 3.3 percent increase. The number of minority students enrolled also rose 3.6 percent to 5,116 compared to 4,940 last year. This year’s mean ACT score of incoming freshmen remained steady at 25.7. In comparison, students across the state of Missouri averaged 21.6 on their ACT scores, and students throughout the nation had an average score of 21.1. Mizzou’s six-year graduation rate increased to an all-time high of 70.8 this year, indicating that as enrollments have grown, more students are staying at MU and graduating.